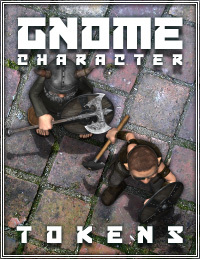 This pack of tokens brings you six Gnome character token sets for use with virtual tabletop software such as Fantasy Grounds, Battlegrounds, or Roll20. Use the character tokens to display Player Characters on the tabletop, or Game Master controlled Non-Player Characters such as Gnome villains! The tokens have been rendered and scaled to match one inch to every three pixels scale (1:3). This scale matches all of the Studio WyldFurr maps from our Compass Point mini-adventure packs, plus the full range of Studio WyldFurr tokens. Want to view a sample of all the tokens in the set before you purchase? Why not view our Preview PDF that displays all of the tokens in each character set within this pack. The tokens are designed for use with online role-playing software such as Fantasy Grounds, Battlegrounds, or Roll20.net. Because of the special nature of Roll20.net we have included tokens saved into 180 pixel square images so that they scale correctly in Roll20.net. The token artwork was not designed for printing. A new feature we are starting to retroactively introduce with each token pack is a token module for Fantasy Grounds II. The module will be available as a separate downloadable zip file, so that people who do not use Fantasy Grounds II will not need to download it. In order to use the new module, you must drap’n’drop the module file (the file with the .mod file extension) into the Module Folder within your Fantasy Grounds Data folder. Then when you are within Fantasy Grounds II, click on the Tokens icon to open the Tokens Menu window. Then click on the Modules button at the bottom of that window. Next, find the module you wish to activate and “open the book” for that module. You can also select if you want to block players from loading the tokens or Allow players to load the tokens.